Watching Scottish rock-legends NAZARETH punch through a set in modern times leaves a whirligig of emotions, no doubt felt by the band's founding bassist, Pete Agnew. Agnew must have immense pride with his son Lee pounding the kit behind him, even if the loss of Darrell Sweet still stings 16 years later. Beside him, Jimmy Murrison has been slinging axe and paying homage to the NAZARETH's original guitarist Manny Charlton for more than two decades. The hugest loss for Pete Agnew and NAZARETH came when Don McCafferty nobly surrendered the mike a couple years ago following breathing deterioration, which led to his collapse during a gig. "Love Hurts" may have been a cover track, but nobody sings it with bleeding conviction like McCafferty, and it remains a hallmark performance nobody can replicate. No doubt McCafferty's replacement Linton Osborne had to have been quaking with fear the first time "Love Hurts" came his way onstage. Sadly, Osborne has since departed NAZARETH after only two years, reportedly contracting a virus that has left him unable to perform. So presents the conundrum watching NAZARETH's "No Means of Escape" video. It's left as a testament to the bravery of Osborne, who is now replaced by Carl Sentance, formerly of KROKUS, PERSIAN RISK and the Geezer Butler Band. It's also left as a testament to Don McCafferty, who appears at length in a beautiful bonus documentary, "Made in Scotland". NAZARETH's performance at Metropolis Studios in London is okay at best. Linton Osborne couldn't have done better on his own merits, and to his credit, not once does he attempt to imitate McCafferty. Instead, Osborne lets it ride in his own manner, floating his high- and low-end ranges suitably to whatever the band deals him—outside of their best-known cuts. The blusier the number, the tighter Osborne glues to it. As the music gets heavier, he leans in the pocket, if not overly asserting his touch. One understands why Pete Agnew recruited the man, yet the set feels rudimentary and a bit contrived instead of a full frontal push. Core selections from the Roger Glover-NAZ teamed era appear in the set. These selections include the title track and "Bad Bad Boy" from "Razamanaz", "Turn On Your Receiver" and "This Flight Tonight" from "Loud 'N' Proud", and "Silver Dollar Forger" from "Rampant". "May the Sun Shine" from "No Mean City" makes an appearance, and from more recent albums, "Sleeptalker" from "Big Dogz", and "One Set of Bones" plus the title track from "Rock 'N' Roll Telephone", the last album to feature Don McCafferty. Rounding out the set at the end are the obligatory "Hair of the Dog", "Love Hurts" and "Expect No Mercy". Along the way is the once-lost track "See You See Me" that appeared on "From the Vaults". Pete Agnew knows how to turn on the charm with his boyish smiles and rhythmic bass rumbles, and it's pleasing to see him having so much fun nearly 50 years since turning THE SHADETTES into NAZARETH. Jimmy Murrison is likewise a pleasure to watch as he dials up Manny Charlton's best licks and solos while dropping smidges of improv. He tears it up on "Razamanaz" and "Bad Bad Boy", while slaying his own parts on "Rock 'N' Roll Telephone". Murrison delivers twelve-string manna on "May the Sun Shine" and "See You See Me", while the band heavies up well on Joni Mitchell's "This Flight Tonight" and "Expect No Mercy". The bigger attraction to "No Means of Escape" is the 50-minute "Made in Scotland" documentary, which is a mingling of backstage chatter and a recount of the NAZ's history, told largely through the eyes of Pete Agnew and Don McCafferty. Engaging stuff. The documentary winds through the founding of NAZARETH via THE SHADETTES, to their breakout gig at London's famed Marquee club, as well as explaining the Roger Glover and Joni Mitchell connections. "Made in Scotland" focuses on the rise of NAZARETH. Albeit, it blows quickly through the Eighties and Nineties when heritage acts of this caliber were still struggling to retain audiences. McCafferty does his best at keeping a rosy smile through the documentary, but when talking about Darrell Sweet's passing, and a melancholic stroll through the recording studio following his forced retirement, it's compelling to watch the man trying to hold it together. 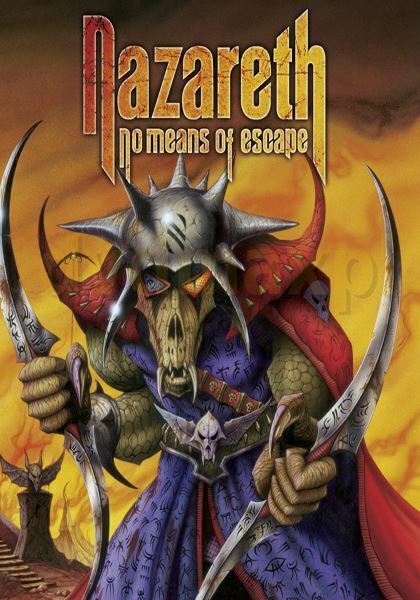 Renowned fantasy artist Rodney Matthews, who resurrected his Tolkien-esque battle ogre from "No Mean City" for this package, designed the cover art, of course. The DVD shows Matthews presenting NAZARETH with a fan-signed and autographed wall print of the "No Mean City" art, which should put a smile on any long-term NAZ fan. Also included in this DVD package is an acoustic session version of "Sunshine", expanded interviews with Pete Agnew and Don McCafferty, and a "Meet the Superfans" segment.